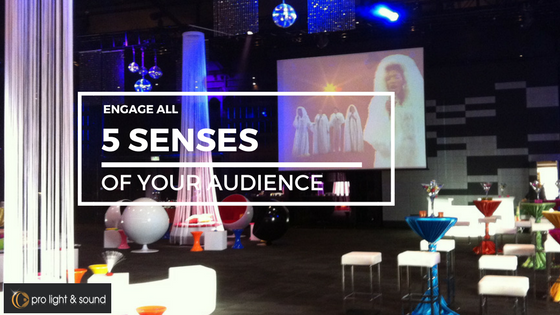 Creating an overall incredible experience for your event-goers is all about engaging each of their 5 senses. Although you can certainly ensure a good time for your guests with some fun lighting and a great playlist. Making sure your audio and visual equipment is specifically installed for your event needs will ensure that your event will go from good to great. By creating synergy between it and the catering, interaction and scents of your event, you can create a memorable occasion that will go down in history. It’s important to create a visual spectacle for your guests – the ‘wow’ factor that will have them in complete awe of the space around them. Afterall, visual aids can help to impact the long-term memory of your attendees. The right soundtrack playing at your next event can be the difference between guests having a good time or a great time. According to the University of Missouri, upbeat music increases activity in the areas of the brain that are associated with pleasure and reward – so be sure to include hits that really liven up the venue and encourage your guests to enjoy themselves. By incorporating interactive displays and zones for your guests, you can deeply encourage engagement with a product, idea or service. Try having different areas that event-goers can explore themselves, such as Q&A boards, photobooths, iPad games and newsletter sign-ups. These and other such interactive displays allow your guests to enjoy a hands-on experience. If you want to make a lasting impact on your attendees, consider the smells at your event. According to The Sense of Smell Lab, smell is the most linked to memory of all of our senses, making it a hugely important aspect worthy of your focus to ensure your guests’ nostrils are filled with pleasant and welcoming scents. Our taste buds are largely influenced by the smells we experience while eating, with 70% to 75% of taste being derived from scent, according to David W. Brooks, a lecturer at the University of Nebraska. By offering incredible catering that smells delicious, as well as keeping the area where guests will be eating smelling wonderful, too, you can ensure guests love your food and event. For all your audiovisual needs talk to a Pro Light & Sound consultant. Our world of experience means that we know exactly how to help you engage your audience so that they have a fully immersive 5 senses experience.